Some years ago, Analog published my story, Birch Glow, about glow-in-the-dark Christmas trees. The premise of the story was that the enzyme luciferase would be taken from fireflies and injected into trees so that nobody would ever have to festoon their Christmas trees with strings of lights. Little did I know that luciferase is found elsewhere in nature, including in a species of mushroom known as Omphalotus illudens. Because it’s bright orange, it’s also called the jack-o’lantern mushroom. 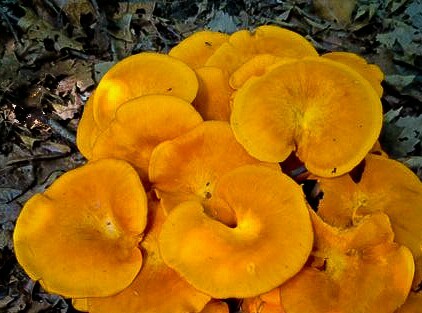 Nor did I suspect that I would find big clumps of these orange mushrooms growing on the wooded hillside behind my house. So here’s what they look like in the wild in the afternoon. And in the dark, when you look at the underside of the mushroom, they say that its “gills” glow a striking dark green. Or maybe not, in the case of the ones I found. Oh one more thing — as lovely as they are to look at, they are poisonous. While they may not out-and-out kill you, they’re said to induce symptoms that will make you wish they had done so.